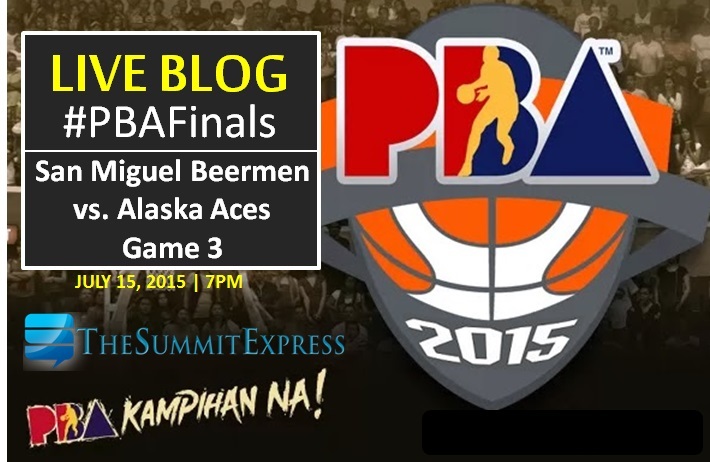 Catch the live action on TheSummitExpress for the Game 3 of 2015 PBA Governors' Cup Finals. MANILA, Philippines – The Alaska Aces might be down 2-nil, but it won’t stop them in bouncing back and spice up the 2015 PBA Governor’s Cup Finals against the hot-handed San Miguel Beermen. Coach Alex Compton had 2 full days of reinventing his game plan and will try to do a probable game 3 comeback tonight, July 15, 2015 at the Smart Araneta Coliseum in Cubao, Quezon City. “The Cebuano Hotshot” Don Don Hontiveros cannot really believe in his game 2 lackluster 0 point performance and still being haunted by his 2 missed free throw shots that could have been Aces’ saving factor on the dying minutes. Hontiveros vowed to wow the crowd tonight as he and his team face the Beermen for the 3rd time in this finals series. Coach Compton insisted that he has been outcoached by his finals rival Coach Leo Austria in game number 1 which the latter didn’t bite at all. Austria rather believed that Compton was just playing mind games. The Aces came prepared from the beginning of game number 2 and led the Beermen for almost 4-full quarters. Job well done for Alaska boys as they imposed a glue-tight defense on SMB and limited them to take shots from the outside. Beermen’s hot shooting from the downtown was almost impeccable since they played Rain Or Shine Elasto Painters in the semis until game 1 of the finals. Normally, Arizona Reid and Marcio Lassiter almost automatically connect their long bombs. But during their previous game, it looked like their hot shooting hands turned cold as ice. Not until the expiring minutes of the final quarter where Marcio Lassiter drained a dagger three-pointer from the left corner that turned things around. If only Don Don Hontiveros made his 2 foul shots, The Aces should have evened the series. Tonight’s game is pivotal for both teams. 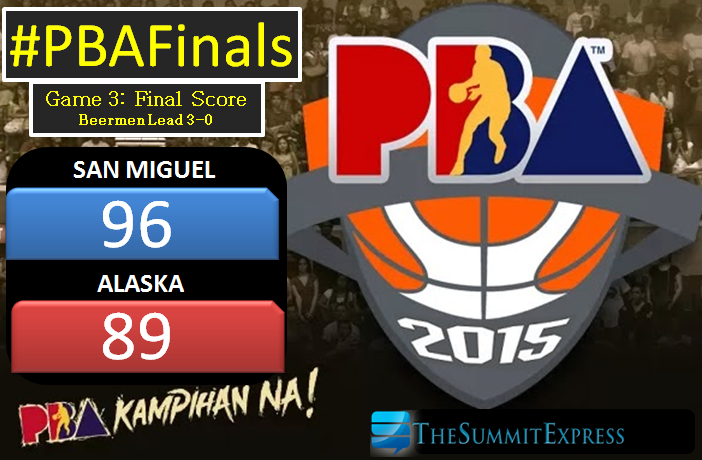 If San Miguel makes it 3 in row, it would be virtually impossible for Alaska to win the series. If Alaska cops a win, they will carry the momentum to game number 4 and has a high possibility of tying the series 2-all. Game begins at 7 p.m.
UPDATE: San Miguel Beermen threatens Alaska Aces for 4-0 victory. Game 3 Final score: 96-89.